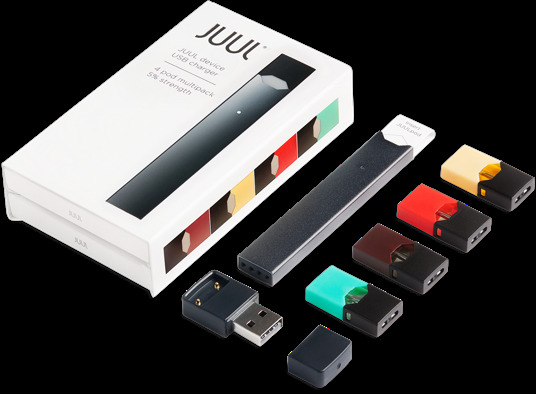 The JUUL Electronic Vapor Cigarette by Ploom may just be the first real GREAT e-cig! Ploom has invested a ton of money and research into developing the first truly satisfying e-cigarette for current smokers. With the right flavor, consistency, power and nicotine strength it is the best bet for anyone trying to quit smoking! Remove colored cap & insert cartridge end into device. Voila - it becomes your mouthpiece as well as the flavorful engine that powers JUUL. No buttons or switches, just draw to get it going - carefully at first, it may seem strong to first-timers. The indicator glows during use to reflect pull strength and while charging. When pod is inserted, gently tap device twice to show charge level. Stand device in magnetic USB charger. Reaches full charge in 1 hour.